Trak-It is a gas-powered fastening system used for light-duty static applications including drywall track to concrete, block or steel, lath to concrete or block, furring strips to concrete or block, and plywood to concrete or block base materials. The high performance system is designed for speed, efficiency and consistency. The original Trak-It® Gas Fastening Tool from Powers is significantly lighter, faster, and more reliable than competitive gas tools. A fuel cell contains enough gas to install up to 800 or 1,200 fasteners depending on the tool. Operation of a gas powered fastening system does not require special safety training or license. 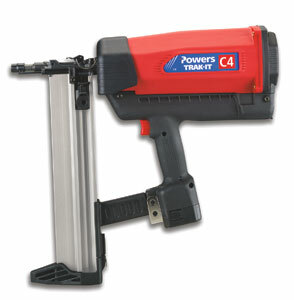 Powers' Trak-It® C4 has redefined high volume gas fastening for steel and wood to both steel and concrete. This completely portable system eliminates the need for compressors and hoses, which can be significant dangers on the jobsite. Speed, power and rugged durability are the hallmarks of this revolutionary fastening product line. Trak-It® C4 is a high volume production tool in steel track to concrete applications. Just load the 42 pin track and go. Shoot metal track, lath or furring strips to concrete, block, brick and steel. Shoot sill plate to concrete foundation.